When one thinks about Hawaii, you usually start day thinking about sunshine, perfect weather, palm trees, hula dancing, beaches and surfing. One other thing that might be missing from your daydream bubbles is shave ice (though kudos to you if you’re ahead of me here). How else do you cool down after a hard day’s work of chilling on the beach, sipping mai tai’s and snacking on macadamia nuts from the ABC store? So what exactly makes a good shave ice? For me it’s all about two things. One, what is the consistency of ice like? Is it chunky like a snow cone or is it smooth like a icee or slurpee? The perfect shave ice sits in the middle. A sign of a good shave ice is the snow-like consistency that absorbs the toppings instead of just sinking to the bottom. Second, what toppings are available? For me, I’m always looking beyond the generic red and blue syrups and instead are more exotic like mango, lychee, pineapple, guava, condensed milk, and azuki bean. The more wild and out of world the combinations they come with, the better. Anyone who knows me knows I love my desserts so today’s count down is all about the best shave ice stores in and around Honolulu and the island of Oahu. This modest sized store is the kind of place that if you drove by, you wouldn’t bat an eye at because it’s so non-descript and tiny but inside this family run business is the kind of place that the chained shave iced places you’ll find in Waikiki just can’t beat. When you walk in, you’re unloaded with a menu of at least 50 flavors. You’ll see anything from creme brulee to red velvet, and mojito. On top of that, you can add ice cream and mochi on top to make your shave ice even more heavenly. What most people will remembler about Shimazu is their portions. Even their small size is generous at best and is almost as big as my head. I kid you not. Tips: Bring cash only. Beware of the parking situation as you will most likely have to find street parking away from the store or you may have to park at the Foodland or McDonalds nearby. Waiola is honestly a tough toss up against Matsumoto but here goes. Waiola, like Shimazu, is also a shabby looking hole in the wall without a single Honolulu hotel in sight but once you have their shave ice, you’ll know why everyone makes the trek out here. Out of all 3 stores, I have to say that this has the most fine and soft ice and that’s the big thing that separates Waiola from the pack. You’re really eating snow when you order a shave ice at Waiolo. I will say though that their flavors are definitely not as extensive nor as creative as Shimazu’s. Waiola is all about honining in on the basics and truly make sure it’s up to fluff (get it??). Some flavors that are really good are mango lychee with condensed milk and pineapple, orange, and guava. Tips: They don’t take credit card for orders less than $10. The parking situation is also a little rough here but there is a free adjacent parking lot. Although not quite in Honolulu, a trip to the island wouldn’t be complete without a drive up to the North Shore and Matsumoto’s Shave Ice. It’s a pilgrimage of sorts. Just like all the other shave ice stores, the store front is unremarkably dull and easy to miss but once you see the long line leading outside, you know you’re in for a treat. The texture of the ice at Matsumoto’s is almost as soft as Waiola’s but there’s a tinge more iciness to it that becomes more of a personal preference than anything. At 40 flavors, most will come as pretty normal but look closer and you’ll see some interesting flavors like Pickled Mango, White Cake and Mizore. So even though the flavors might not be as wild as Shimazu, Matsumoto holds its own especially with their Green Tea and Azuki specials. I ranked this spot number one in part due to nostaligic reasons as my first shave ice experience in Hawaii but also because the prices are a lot cheaper than the other places. Shimazu can easily run you close to $10 if you’re not careful and Waiola after toppings will get you up to $6 but at Matsumoto’s a green tea special with all the fixings will only cost you $5. Tips: Parking isn’t too big of a problem as there’s a big dirt parking lot next door and available street parking. I would also highly recommend getting the plastic cup holder for your shave ice for an additional $0.30 as without it, you’re going to have major spillage issues. If there’s anything I’ve imparted from this list, I hope it’s that you will absolutely try shave ice on your next visit to Hawaii. There’s nothing that beats a cone of snow flakes infused with delightful flavors to cool down with. Thanks for stopping by Louise! 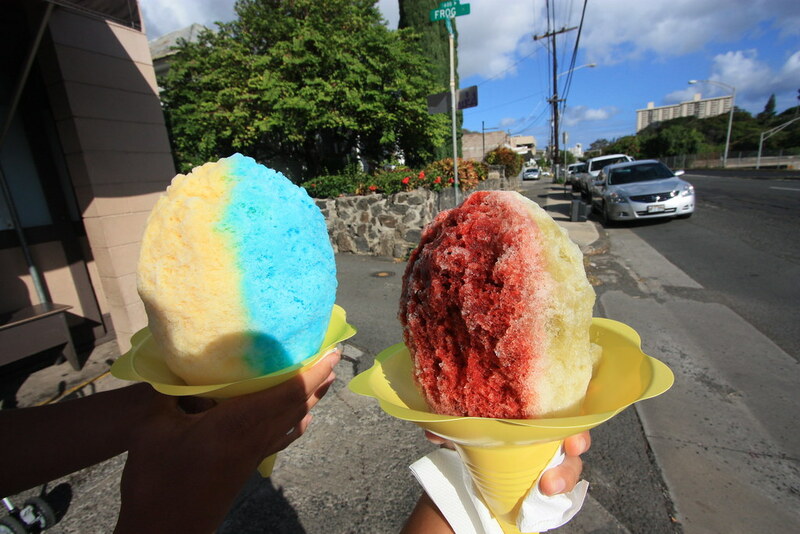 Hope you get to visit a few of these shave ice spots in Hawaii next time you go! The Waiola shave ice looks delicious! Can’t wait to go to Honolulu, haha! Are you heading there soon Jeremy?